1دکتری تخصصی، گروه روانشناسی بالینی، دانشگاه شهید چمران، اهواز، ایران. 2کارشناسی ارشد، گروه روان شناسی بالینی، دانشگاه شهید چمران، اهواز، ایران. 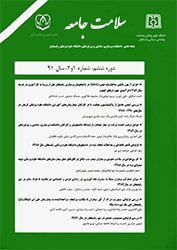 مقدمه: سلامت روان، مهم‌ترین عامل مؤثر در رشد و پرورش استعدادهای دانشجویان می­باشد. یکی از شاخص‌های ارزیابی سلامت روان؛ احساس گناه است که فرد را تحت تأثیر قرار می‌دهد. پژوهش حاضر، با هدف پیش­بینی سلامت روان بر اساس احساس گناه سالم و ناسالم در دانشجویان دانشگاه شهید چمران اهواز در سال 1396 انجام گرفت. نمونه­گیری تصادفی طبقه­ای انتخاب شدند. از 2 پرسش­نامه احساس گناه سالم و ناسالم و مقیاس سلامت عمومی به عنوان ابزار جمع­آوری داده­ها استفاده شد. داده­ها با استفاده از ضریب همبستگی پیرسون و تحلیل رگرسیون خطی چندگانه تجزیه و تحلیل شدند. می­باشد که مهم‌ترین متغیر پیش­بین در پژوهش حاضر است. ضرایب تحلیل رگرسیون با روش ورود مکرر برای ترکیب خطی متغیرهای احساس گناه سالم و ناسالم با سلامت روان در سطح کمتر از 001/0 معنی­دار بود. می­شود و از سویی دیگر در بروز نشانگان و رفتارهای ناسازگار نقش دارد. 2MSc, Dept of Clinical Psychology, Shahid Chamran University of Ahvaz, Ahvaz, Iran. Introduction: Mental health is the most important factor in the growth and development of students' talents. One of the indicators of mental health assessment is the feeling of guilt that affects the person. The present study was aimed to predict the mental health of students of Ahwaz University of Shahid Chamran based on healthy and unhealthy guilt in 2017. Materials and Methods: In this Analytical and cross-sectional study, 300 students were selected using randomly stratified methodology. Two questionnaires regarding healthy and unhealthy feelings of guilt and mental health scale were used as means of data collection. The data were analyzed using Pearson’s correlation coefficient and multiple linear regressions analysis. Results: The results showed that healthy (r=-0/193) and unhealthy feelings (r=0/303) of guilt were significantly correlated with mental health status (Incompatible aspects of mental health) (p<0/05). The highest correlation coefficient was related to unhealthy feelings of guilt, which was the most important predictive variable in this study. The regression coefficient between healthy and unhealthy feelings of guilt with mental health was statistically significant at < 0.001. Conclusion: According to the results of this research, On the contrary of traditional view of feelings of guilt, this feeling probably does not play a main role in developing mental disorders and it is not always maladaptive. In fact, feelings of guilt have a range from adaptive to maladaptive behaviors. Hoeymans N, Garssen AA, Westert GP, Verhaak PF. Measuring mental health of the Dutch population: a comparison of the GHQ-12 and the MHI-5. HQLO 2004;2(1):23-35. 4.Hu J, Gruber KJ. Positive and negative affect and health functioning indicators among older adults with chronic illnesses. Issues in mental health nursing 2008;29(8):895-911. Fergus TA, Valentiner DP, McGrath PB, Jencius S. Shame-and guilt-proneness: Relationships with anxiety disorder symptoms in a clinical sample. JAD 2010;24(8):811-5. Tilghman-Osborne C, Cole DA, Felton JW. Definition and measurement of guilt: Implications for clinical research and practice. CPR 2010;30(5):536-46. Tangney JP. Conceptual and methodological issues in the assessment of shame and guilt. BRT 1996;34(9):741-54. Harder DW. Shame and guilt assessment, and relationships of shame-and guilt-proneness to psychopathology. IJP 1995;12(7):368−92. Inozu M, Karanci AN, Clark DA. Why are religious individuals more obsessional? The role of mental control beliefs and guilt in Muslims and Christians. JBTEP 2012;43(3):959-66. Duhachek A, Agrawal N, Han D. Guilt versus shame: Coping, fluency, and framing in the effectiveness of responsible drinking messages. JMR 2012;49(6):928-41. Robinaugh DJ, McNally RJ. Autobiographical memory for shame or guilt provoking events: Association with psychological symptoms. BRT 2010;48(7):646-52. Pineles SL, Street AE, Koenen KC. The differential relationships of shame–proneness and guilt–proneness to psychological and somatization symptoms. JSCP 2006;25(6):688-704. Valentiner DP, Smith SA. Believing that intrusive thoughts can be immoral moderates the relationship between obsessions and compulsions for shame-prone individuals. CTR 2008;32(5):714-20. Howell AJ, Turowski JB, Buro K. Guilt, empathy, and apology. PID 2012;53(7):917-22. Roos S, Hodges EV, Salmivalli C. Do guilt-and shame-proneness differentially predict prosocial, aggressive, and withdrawn behaviors during early adolescence? Developmental Psychology 2014;50(3):941-6. Woien SL, Ernst HA, Patock-Peckham JA, Nagoshi CT. Validation of the TOSCA to measure shame and guilt. PID 2003;35(2):313-26. Orth U, Robins RW, Soto CJ. Tracking the trajectory of shame, guilt, and pride across the life span. Journal of Personality and Social Psychology 2010;99(6):1061-71. Hale MA, Clark DA. When good people have bad thoughts: Religiosity and the emotional regulation of guilt-inducing intrusive thoughts. JPT 2013;41(1):24-35. Passanisi A, Sapienza I, Budello S, Giaimo F. The relationship between guilt, shame and self-efficacy beliefs in middle school students. PSBS 2015;197:1013-7. Baumeister RF, Stillwell AM, Heatherton TF. Guilt: an interpersonal approach. Psychological bulletin 1994;115(2):243. Goldberg DP, Hillier VF. A scaled version of the General Health Questionnaire. Psychological medicine 1979;9(1):139-45. Bagheri A, Bolhari J, Peiravi H. Student Student's Mental Health Status. IJPCP 2005;1(4):30-9. Cheung P, Spears G. Reliability and validity of the Cambodian version of the 28-item General Health Questionnaire. SPPE 1994;29(2):95-9. Dein S. The origins of Jewish guilt: Psychological, theological, and cultural perspectives. JSMH 2013;15(2):123-37. Graton A, Ric F, Gonzalez E. Reparation or reactance? The influence of guilt on reaction to persuasive communication. JESP 2016;62:40-9.